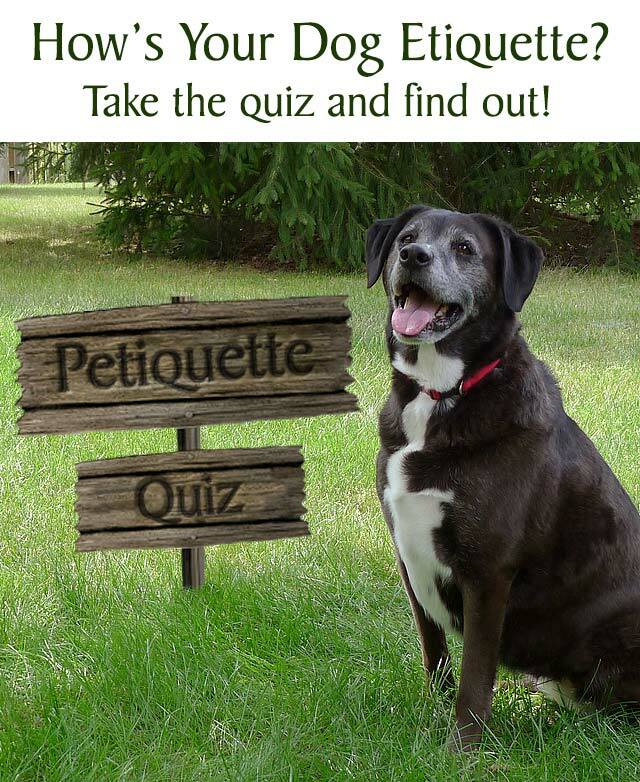 Check Your Petiquette Quiz! - How's Your Dog Etiquette? Check Your Petiquette Quiz! – How’s Your Dog Etiquette? I’ve been reading numerous articles lately about inconsiderate dog owners. All those rants and open letters made me realize that we focus a lot on how well our dogs behave, but not so much on how well we behave as dog owners. So, I’ve taken some common complaints and turned them into a quiz to see just how mannerly we are as pet parents. 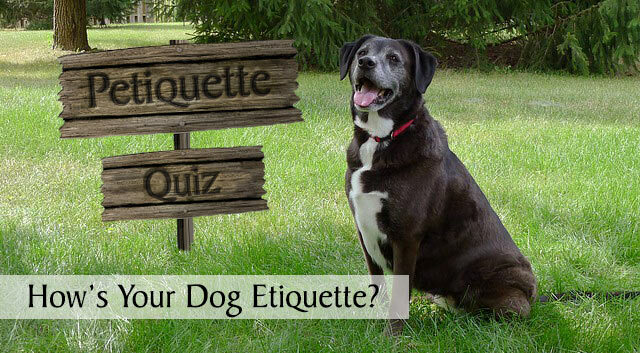 To check your dog etiquette and see how you compare to other dog owners, just click the ‘Start Quiz’ button below. How did you do? After taking the quiz myself, it looks like I have a few things to work on. There have been more than a few door-to-door salesmen that Haley’s surprised by bolting out the front door and she gets pretty excited when guests arrive for a party, especially my parents who usually have a few treats hidden in their pockets for her. I guess there are always things to work on and room for improvement when it comes to petiquette. Post your score in the comments below if you’ve earned bragging rights and share a few of your own rants about dog owners if I missed highlighting them in the quiz. If your dog is playing in a dog park or other off-leash area with other dogs, what do you normally do? I walk around with my dog so I can keep an eye on him and intervene or clean up after him if necessary. I like to talk with the other dog owners to share tips and stories. I'm usually texting or catching up with friends and family on my cell phone. If you use a retractable leash, what kind of control do you have over your dog? I don’t use a retractable leash OR it never causes a problem for other people or their dogs. The leash works pretty well for me except when my dog suddenly cuts in front of someone or takes off unexpectedly. I like that my dog has more freedom with a retractable leash, so it’s worth the hassle of occasionally getting tangled up with other people or their dogs. What do you do if your dog barks excessively? My dog doesn’t bark excessively OR I give him a "Quiet" command and distract him from what's causing the barking. I try to keep my dog from barking too much but it's not always easy to keep him quiet. All dogs bark, it's what they do. I don’t worry about it that much. Does your dog normally stay within the boundary of your property? Yes, my dog stays within the confines of my property unless I take him somewhere. My dog normally stays on my property and only roams occasionally. My dog likes to explore outside of my property boundaries but always comes back home. When staying with your dog at a someone’s house or a hotel, do you make sure your dog is clean and do you follow the house rules? Yes, I try to be a thoughtful guest and set an example of a good dog owner. I try, but I’m not super particular about it. I tend not to worry about those details or what some people think. 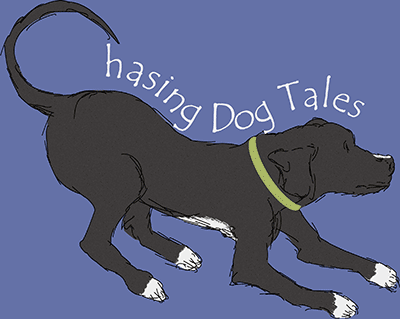 Does your dog know (or are you teaching) basic commands such as Sit, Stay, Come? Yes, I can’t imagine having a dog that doesn't know these commands. I’ve tried teaching my dog these commands but I’ve kind of given up because my dog doesn't listen well. I haven’t gotten around to doing any training yet. Are you respectful of people who have allergies or are uncomfortable with dogs? Yes, I don’t want my dog to make anyone uncomfortable. It depends on the situation but it's not a huge priority to me. If someone is allergic to dogs or uncomfortable with dogs, it’s really their issue, not mine. How does your dog normally react when guests come to your home? My dog greets guests calmly or I've taught him not to jump on guests. Sometimes my dog jumps on guests, depending on who is visiting or how excited he is. Guests that come to my house like to be around dogs so they don’t mind if my dog jumps on them. When you’re out with your dog, do you scoop the poop? I always scoop the poop and I don’t want to step in anyone else’s dog poop either. Usually, but not every single time. It’s natural and biodegradable so I don’t worry about it too much. Do you prevent your dog from rushing up to strangers or other dogs? Yes, I want to make sure my dog greets others appropriately. No, my dog’s friendly so I don’t want to be too strict when he gets the chance to meet new people or dogs. When a stranger comes to your door, how does your dog usually respond? My dog listens to me and stays inside or behind me while I answer the door. My dog gets pretty excited but I try to keep him from squeezing around me to see who's at the door. My dog usually rushes out the door to greet the person but he's a friendly dog so I don't worry about it. If your dog’s not getting along with other dogs or causing an issue for people around you, how do you handle it? I usually leave or remove my dog from the situation. I do my best to manage the situation but sometimes it gets worse. I let the dogs work it out themselves. People shouldn’t expect all dogs to be well-behaved. When walking your dog, do you ask permission before allowing your dog to greet another person’s dog? If I allow my dog to greet other dogs, I always ask permission first. I don’t always have time to ask because I'm trying to control my dog from pulling so hard towards the other dog. I don't ask because it’s good for dogs to socialize and greet as many other dogs as possible. Do you allow your dog to play aggressively with other dogs? No, I usually intervene when rough play escalates too much. Yes, I don’t worry about it unless a fight breaks out. Yes, dogs teach and learn from each other and it's best to allow them to work out any disputes without intervening, even if they're fighting. Do you allow your dog to beg from guests when food is served in your home? My dog’s not a beggar or I make sure he’s kept away from guests while they're eating. Sometimes, unless my dog is obnoxious about it or drooling on their lap. Guests that come to my home don’t mind if my dog begs from them. Do you allow your dog to run off leash in areas where there are leash rules or laws? No, I would only let my dog off leash in areas that are designated for off-leash dogs. Yes, because my dog has excellent recall and is always under my control. Yes, because my dog is friendly and has never caused a problem with any other dogs. What do you do when you meet a service dog? I ignore the service dog. I usually ask the owner about their dog because it's interesting to learn how different service dogs help their owners. I try to greet or pet the dog because I know they must be friendly and I don't want to appear rude by ignoring the dog. Do you apologize when your dog upsets or inconveniences someone? I don't always feel the need to apologize because most people like dogs and are understanding. I don’t normally apologize because people shouldn't get too worked up when a dog does something wrong. Do you ask permission before taking your dog to someone’s home or place of business? I always ask first to make sure it’s okay. If I think people or the business won’t mind, I don’t normally ask. My dog gets along well with everyone and has good manners, so it’s usually not an issue. Do you often yell or scream at your dog to get their attention or make them listen? No, my dog listens pretty well. Sometimes, especially if my dog is really excited or distracted by something. That’s the only way to get my dog’s attention. Everything else, I am considerate about. We don’t walk the girls on flexis (except for at the beach in a controlled manner), I don’t allow them to door dash. They occasionally beg from us but we don’t allow them to beg from guests. When I’m out with them, they have my full attention and I don’t answer my phone, even if it’s my husband calling. Thanks Lauren, I probably could have been more clear on the question about allergies. I agree that if someone comes into your home and has allergies, they would have to expect it could be an issue for them. Great job and thanks for taking the quiz! ? Two of out three is pretty darn good! We’re always practicing on something around here and I only have one dog. I tip my hat to all of you that have multiple pets. I think I failed on the last one about the door. My Human is always working on that with me. If certain friends arrive I almost knock my Human down to greet them. If I don’t know the person, I will remain politely waiting for an okay to greet them. I might jump up and down with excitement but I know better than to put a paw on anyone! My pet peeve is retractable leashes. A dog with a retractable leash charged me and tripped my Human. Her head hit the pavement and she ended up unconscious. She ended up in the hospital with a concussion. Fortunately because I’m well trained I never left my Humans side, even though I was loose in a rest stop on an interstate. How scary is that! You’re not alone on the door issue, Hawk. That’s been a problem for Haley, but actually it’s my problem because I tend to worry too much about keeping someone waiting at the door rather than taking the time to work with her. What a great quiz. I firmly believe a well trained human leads to a well trained dog! Well put, Denise! We humans have to do our part too. ? Great quiz – I know the ones I scored lower on…and know I should work on those areas. Me too, there’s always some work to do on training around here. Thanks for taking the quiz! Brilliant quiz! My dogs are very excitable when guests come to the door. I know I should work on their continuous barking at the living room window! They usually get excited and whine when people they know come, but when it’s a stranger, there’s a hint of protectiveness, especially from my older dog. Thanks so much, I’m glad you liked the quiz. Some of those issues are going to be more challenging for certain breeds like terriers. I’ve had to work quite a bit with Haley barking at the window too. That’s okay Dolly, we all love you and you got some bonus points if the questions didn’t apply to you. ? Got an 86…not too bad. Did better than I expected to! Not bad at all, Caren! Thanks for taking the quiz. ? I got a 92. Mr. N does want to greet everyone who comes in and if you’re a “guest” in our house, he will probably come sit in your lap at some point. If they’re there in an official capacity (repair people, delivery workers), I make sure he doesn’t bother them. Thank you so much, I’m glad it was helpful. ? I totally get the idea of letting Rita bark sometimes. On those rare occasions when there’s someone slightly suspicious loitering around, I don’t tell Haley to be quiet either. They say the best way to prevent a burglary is to have a barking dog. ? I have two teeny tiny problems. I’m part Beagle and I love to follow my nose. This sometimes leads me into the neighbors yards where there are some very interesting smells not found in my yard. My mom gets the leash out when this happens.?. The other little thing that annoys her is my barking. When I lived in the country there weren’t many noises, like car doors or horns honking. Since I’ve moved in here and the windows have been open lots of days I hear car doors closing, horns, people talking and I think they are coming to visit so I have to let mom know. I only do it with a single bark. Ok, a loud single bark. Sometimes several single barks if she doesn’t come right away. Other than that I’m perfect!? Hi ya, Chops! I sure wish I could train Haley to do that single bark routine. I have to agree, I think you’re perfect too! ? I got a 93%…am I high scorer? LOL…just kidding! I had to answer some of the questions hypothetically, since I don’t take my dogs to dog parks and such, nor do I take them to other people’s homes very often. We have a large fenced in yard so it’s pretty easy to keep the dogs from wandering! I think the thing I have to work on most is helping my one husky keep calm when people come to the door. That’s the same score I got, Jenna! Staying calm at the door is such a challenge for Haley too, maybe some of us need to get together for a group training session on it, haha! Awesome! I should have built in some extra credit points for being totally honest. 🙂 I mentioned to Jenna that we should have a group training session on door greetings, that class size might be quite large, haha! Great quiz & fun too! Lots of thoughtful questions! Mom got a 98% so we’re feelin’ happy about that on National Dog Day! Darn it, lost my high score! LOL. Can I take it again? Just kidding…good job, Kaitlin! I always want to stop and ask questions too and maybe even pet the dog because I admire them so much. Some people with service dogs are open to that and others complain that everyone wants to talk to them and pet their dogs and it’s distracting for the job they’re doing. This was a fun quiz. No worries, we all have some things to work on. 🙂 I’m sorry your new area has some issues with off-leash dogs and unruly owners. We have a few parks in our area that are the same way so we’re always trying new parks and neighborhoods to walk in. Yay, 95%… although I did have to estimate what I would do for a couple of the questions as I don’t usually take Cody to dog parks or let him play rough with other dogs. This was an excellent quiz though! I really enjoyed it! Woo hoo, I got 95%. And I know exactly where I lost points. It’s an interesting way to talk about these issues. It’s become more of a concern for me lately since we’re at a marina whose owner lets her dogs run loose. And they’re not friendly dock dogs that love everyone. At least one has been known to bite people. I’m anxious to get out of there because it doesn’t feel safe for us or Honey. That’s not a good feeling, especially when the dock is your temporary home. I can’t understand why people would let those kinds of dogs roam free, the liability issue alone should be enough to make them want to secure their dogs. What a cool quiz! I got an 83 which I feel happy with. I am always on alert with Shiner, because she does not always like strangers. But I’ve been pretty pleased with her lately. That’s a pretty good score, Ann! There’s always something we’re working on too. I love watching a dog’s progress and it’s so rewarding to know you’re helping an animal overcome their fear or any other challenge they might be having. I got an 86 and i’m ten.I have a bogle/boggle/beagle boxer mix.He’s a year old and he jumps…a lot. but other than that he’s doing well in training.